‘The Muppets’ Promo Videos With Nathan Fillion, Clark Gregg, & More! The Muppets are coming, and I’m pretty sure they made enough promos to have a complete episode. Maybe… that is the 1st episode, just given in 30-50 second increments. No, that would be way too meta. Anyway, if these promos are any indication of what the show will be like, I’m sold. My favorites are the ones with Nathan Fillion (Castle), trying to get with Miss Piggy. Some of the other ABC stars in these commercials are Clark Gregg (Marvel’s Agents of S.H.I.E.L.D. 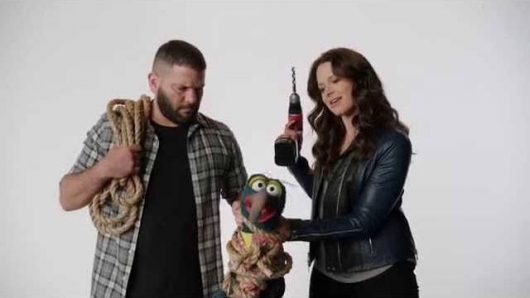 ), Guillermo Diaz (who is fantastic) and Katie Lowes (Scandal), and Wendi McLendon-Covey (The Goldbergs). So… check out the “About the Show” and keep on enjoying the really tiny clips	below. One is the most world renowned frog in the entertainment business, and the other is the most notorious frog in crime. It’s a case of mistaken frog identity in director James Bobin‘s sequel to The Muppets, Muppets Most Wanted. The gang is back together for the sequel that will take them on a tour that takes them around the world and back. Problem is Kermit will be spending a great portion of that tour in prison, while the most notorious frog in crime, Constantine, takes his place. This crime caper flick, which looks to be as much fun, if not more fun, than the film’s predecessor. And of course it wouldn’t be much of a Muppet movie if it did not have any sequels. Tina Fey, Ty Burrell, and Ricky Gervais are the principle cast, but there are cameos made by Danny Trejo, Christoph Waltz, Ray Liotta, P. Diddy, Celine Dion, and Tom Hiddleston (oh please let that be Tom Hiddleston). Hit the jump to see the full trailer. Remember back in September when we told you about the Muppets and their future plans for re-taking over the world (Read: It’s Not Meat, It’s Not Puppets … It’s The Muppets & They’re Coming Back Big!)? Well, they’re still going to do all of that! But as we also said, they never really left us either; those lovable Muppets love to make random TV appearances. 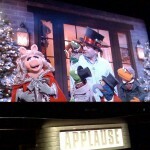 One of these appearances was last night on Late Night with Jimmy Fallon, where the Muppet gang joined Jimmy in singing the “12 Days of Christmas” along with The Roots. Yes, you read that correctly: The Muppets. Jimmy Fallon. “12 Days of Christmas.” The Roots. Wacky, huh? The song is typically known as one of the arduous variety, but with a little Muppet action, the simple nature of Fozzie Bear, and an appearance by Animal, this is one of the better renditions you’ll check out. As always, click on over to the other side to check out the video, and a very Happy Holidays to all of you wonderful readers we have!